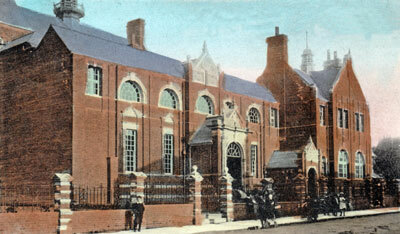 The Technical Institute and Seely Library, in Upper St James' Street, was built in 1904 on the site of a former nursery. The library, built with the support of Sir Charles Seely of Brook, became the first public lending library in the country and would, over the coming years, spread acro the whole Island. The Technical Institute was built to provide "technical education" lectures in many subjects, including horticulture. Practical horticulture was practiced in the gardens - now the site of the big playground on Medina Avenue. It also provide evening education for adults. In 1907 Newport County Secondary Grammar School moved into the building and remained until 1958 when they moved to a new purpose built campus at Carisbrooke, and became known as Carisbrooke Grammar School (later Carisbrooke High School). Since then, the building has been the location various educational establishments (Priory Girls, Nodehill Middle School etc).